I've been working to help a friend to get his .270 Win Rem 700 BDL to be more accurate. When shooting his rifle yesterday, one aspect of his rifle that caught me off guard was how flatten his primers were. When he shot the factory 130gr Rem BT, the primers were flat as a pancake and some had ridges around the firing pin dimble. The first handload I had made for him also had a flatten primer. When I asked him, he told me every round he shoots from his gun comes out this way. The hand load was half way between min and max range (58.0 gr H414). Pictures are below. Any suggestions or insights? Ok, now I have the picture loaded. Maybe its not as bad as I thought when magnified. The marks on the bolt head do leave a good imprint however. You can catch your finger nail on the ridge around the firing pin dimple. Here is what the primers looked like for Barnes 110 TTSX and 60.0gr of H414 (max load from Barnes Handbook #4). No ridge around the firing pin dimple. Looks pretty typical of a 700 to me !!! From what I can see of the picture the primer still has a rounded edge and does not fill that part of the void in the cup. I've had 700's fill that void with loads that were well under max. Keep in mind that primers are only one aspect to reading pressure signs. 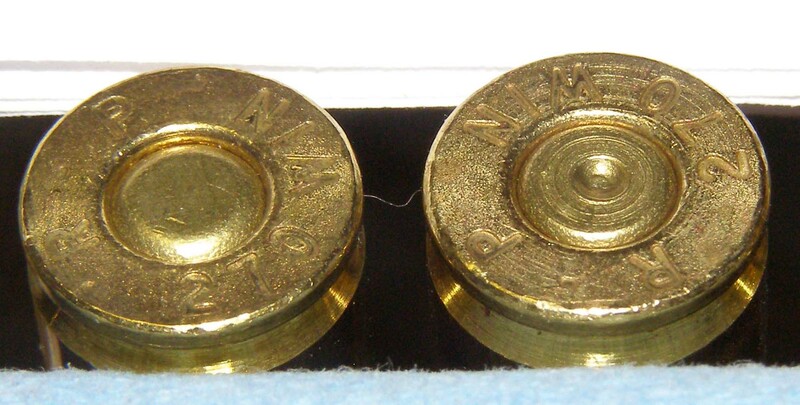 When loading for the Remmys I tend to look more at the amount of resistance there is in opening the bolt and if there are any bright marks on the case head from it. If you do get a lot of resistance and markings I think you already know the answer to that. 2. The primer sets off the powder charge pushing the primer out just a bit (depending on head space). 3. The expanding pressure of the burning powder pushes the case back against the bolt face reseating the primer and smashing it at the same time. Hense the flattened primer. 1. Cratered primers (primers being forced into the firing pin hole). This will be VERY obvious. 2. Soot leaking around the primer and the pocket. 1. You are wearing parts of your gun. The primer in your photo does not indicate cratering. Just an ample firing pin hole. The circular marks are just a rather rough machined bolt face. Yea, primers are an indication of pressure as any reloading manual will tell you. It's also true that there are other indicators of excessive pressure and that you need to use all of them. Also, signs of excessive pressure will be different in guns with different types of actions and even between guns with the same action type. By the way, the primers in the posted photos do not show signs of excessive pressure. Grumulkin...I stand by my post (above). It comes from several reloaders with more time in front of a loading press then my 25 years and my experiences. No disrespect, but I stand by my reloading experiences in loading probably at least 30 different cartridges in many different guns over greater than 40 years without the benefit of pressure gauges or a chronograph. Primers are not the only pressure sign to go by but are an important part of pressure evaluation. What do you do with a Colt SAA, Ruger SAA and a S&W Mod 19 that have flattened priners with 14 grains of 2400 under a 140 grain SJHP. And I do mean, no rounded edge whatsoever. My two 9mmX19's flatten primers at mid range loadings too. Thanks for the discussion. This is the first time I've worked with this gun and I feel more comfortable with going forward based on your observation. The bolt was not hard to lift and velocities were in the range of what should be expected. I'm going to load up at least 5 more 59.5gr and another 3 of 60.0gr (max) and shoot again. I think the windage screws were going bad on his Leupold rear scope base. I've had this happen to me before and horizontal stringing is your fist indication the screws are about to fail because of metal fatique. Bushmaster, would you please translate your remarks to the belted magnums? A belted magnum such as the .300 WM, headspaces on the belt, not on the shoulders. In my opinion this gives less chances for case movements in the neighbourhood of the primer. It can still come down to the amount of head space. No or "0" head space and no backed out primers to reseat and smash. An amply drilled chamber and the belted will have this so called problem. I have and still hunt with an old Winchester .30 WCF. As you know they headspace on the rim. Mine use to, but now (because of primers that backed out) is headspacing on the shoulder. No more crushed primers and no more primers backed out. I hardly ever pay any attention to my primers after firing anymore. None of my loads exceed maximum powder charge (except one and that depends on which load manual you look at). If I note any other sign of high pressure I might have a look at the primer, but....I work up new loads slowly until I find a sweet spot. Rarely do I have an over pressure load. No one else should either if they are paying attention to what they are doing and being careful. From my (limited - only 45 years of shooting) experience you are both right. Primer deformation certainly will occur with over-pressure loads. But flattened and cratered primers alone often do not mean that excessive pressure was generated. Cratered primers can be caused by a worn/oversized firing pin hole. 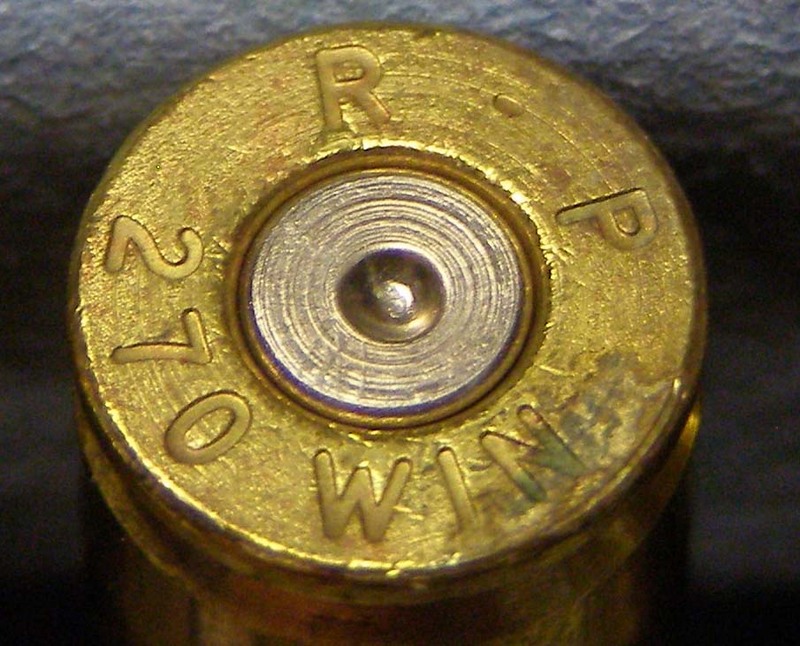 They can even be caused by cases having sizing lube left on the brass which prevents the case from seating properly against the chamber wall when fired. Flattened primers often are a result of even a small amount of extra headspace. Soot leaking around the primer and blown primers are definite signs of high pressure. Bushy's first post explains the situation very well, but I would not agree that "Primers are not an indication of pressure and should not be use as an indicator." This is misleading. "Primers are not always an indication of excess pressure and will usually be accompanied by additional signs of overpressure." Is less misleading. I know, small distinction, right. I feel that some of the reloading manuals put too much emphasis on examining primers as a first sign of possible pressure problems. It is an easy symptom to illustrate in photos and often an early warning sign, but definitely not the be-all-end-all of signs to look for as it is often presented. Even a harder to open bolt may not be a sign of high pressure. This often happens when ammo is neck-sized. After a few reloads, neck-sized brass will fit quite tightly in the chamber. I always full-length resize my brass after it has been reloaded two or three times with neck sizing only. Slim, the primers in the photo definitely DO NOT show signs of excess pressure. The edges at the outside diameter of the primers are still well rounded, not flattened. Even a harder to open bolt may not be a sign of high pressure. This often happens when ammo is neck-sized. This why I mentioned the shiny markings on the case head........ I've never had them appear on neck sized brass unless the pressure was to high !!! Once you get to know how the bolt feels on a particular rifle (if you pay attention to those sort of things) you'll be able to start feeling a slight difference when the pressure is raising. Even a harder to open bolt may not be a sign of high pressure. This often happens when ammo is neck-sized. After a few reloads, neck-sized brass will fit quite tightly in the chamber. I found this to be especially true with Federal brass which is a bit soft.